In this post, we are going to learn a very old grand father of modern processors, named 8085 and his colleague 8255. The 8255 can be either memory mapped or I/O mapped in the system. In the schematic shown in above is I/O mapped in the system. Using a 3-to-8 decoder generates the chip select signals for I/O mapped devices. The address lines A4, A5 and A6 are decoded to generate eight chip select signals (IOCS-0 to IOCS-7) and in this, the chip select IOCS- 1 is used to select 8255. The address line A7 and the control signal IO/M (low) are used as enable for the decoder. The address line A0 of 8085 is connected to A0 of 8255 and A1 of 8085 is connected to A1 of 8255 to provide the internal addresses. The data lines D0-D7 are connected to D0-D7 of the processor to achieve parallel data transfer. The I/O addresses allotted to the internal devices of 8255 are listed in table. It has 40 pins and requires a single +5V supply. The INTEL 8255 is a device used to parallel data transfer between processor and slow peripheral devices like ADC, DAC, keyboard, 7-segment display, LCD, etc. The 8255 has three ports: Port-A, Port-B and Port-C. Port-A can be programmed to work in any one of the three operating modes mode-0, mode-1 and mode-2 as input or output port. Port-B can be programmed to work either in mode-0 or mode-1 as input or output port. Port-C (8-pins) has different assignments depending on the mode of port-A and port-B. If port-A and B are programmed in mode-0, then the port-C can perform any one of the following functions. As 8-bit parallel port in mode-0 for input or output. As two numbers of 4-bit parallel ports in mode-0 for input or output. 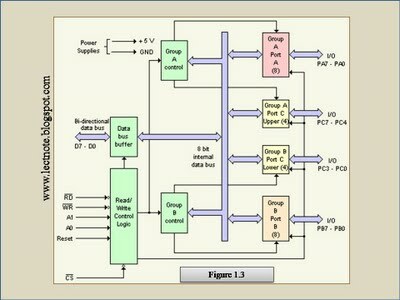 The individual pins of port-C can be set or reset for various control applications. RD (low): This control signal enables the read operation. When this signal is low, the microprocessor reads data from a selected I/O port of the 8255A. WR (low): This control signal enables the write operation. When this signal goes low, the microprocessor writes into a selected I/O port or the control register. RESET: This is an active high signal. It clears the control register and set all ports in the input mode. What are mode-0 ad mode-1 operations. What is the diff b/w two?